The Firm: Mystery and Suspense on Television. Picking up 10 years after the events of the 1993 film adaptation of the John Grisham legal thriller, The Firm, this NBC series finds lawyer Mitch McDeere (played by Josh Lucas), who worked with the FBI to bring down a Memphis law firm associated with the Chicago mob, coming out of near total isolation after his family spent a decade in the Federal Witness Protection Program. The McDeeres are ready to return to their old lives and leave the past behind them — but the mob has a long memory. Add that to Mitch's new association with another firm that may or may not be involved in something illicit, and the path ahead is dangerous and unknown. As old enemies return and new threats emerge, Mitch has no choice but to fight back if he ever hopes to return to some sense of normalcy. But can one man fight a criminal conspiracy? At least Mitch has one thing going for him: he's done it before. 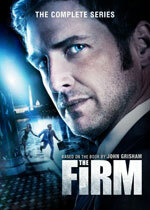 The Firm premiered during the 2011/2012 mid-season, but was not renewed for a second season.